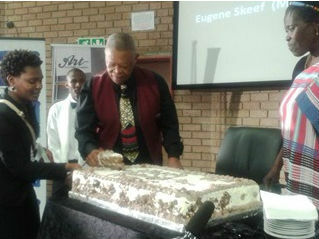 Masekela celebrates his 75th birthday in style! The inaugural Hugh Masekela Lecture. The University of Johannesburg Soweto Campus, Enoch Sontanga building, was abuzz with academics, industry professionals and jazz music lovers who filled the lecture hall in anticipation of a keynote speech by Zimbabwean musical icon Oliver M’tukudzi. The speech was held in honour of world-renowned musical icon Hugh Masekela who is celebrating his 75th birthday. In partnership with wRite Association, UJ hosted their first inaugural Hugh Masekela Lecture on Tuesday night. Professor Tinyiko Maluleke, UJ’s Deputy Vice-Chancellor, said the university was honoured to host the lecture as they believed Masekela embodied the vision and values of the academic institution. “Like Masekela, UJ excels globally whilst upholding its African identity,” he said. M’tukudzi who is an internationally acclaimed, award-winning guitarist and heritage activist described his relationship with Masekela as one of admiration. M’tukudzi also described Masekela as a man who has remained humble despite his magnificent career. “If you treat him like a super star, he will react that way, but often he greets you as a father and brother, except if you are a woman wearing a weave hair piece,” said M’tukudzi. A panel discussion in response to M’tukudzi’s speech was hosted by SAfm radio host, Shadow Twala, musician and poet, Nomza Mazwai as well as Hugh’s sister and political activist Babara Masekela. The topic of Masekela’s distaste for women who wear artificial hair become a talking point of the evening, providing much laughter from the musician and the audience. “It’s not that I dislike weaves, it’s just that I come from an era where people who introduced themselves looked like themselves,” Masekela said - in his own defence. The night was later sealed with a large birthday cake presented to Masekela and a celebratory poem by Temana Masekela, Hugh’s sister. Tonight fans will be treated to a concert by the legendary trumpeter at the Soweto Theatre as a continuation of the birthday celebrations.